If the hurtful things you said to people appeared on their skin, would you still stay them? Sticks and stone may break my bones, but words leave marks you’ll never see. If the hurtful things you said to people appeared on their skin, would you be more careful? Would you be kinder? Would you think before you spoke? Why not start now? The picture on the left features a painting I did when I was 14. I remember painting it on my kitchen counter one afternoon, and feeling so proud of myself when I was done. I felt it was the first time I truly saw what I was capable of painting, and I never thought I would be able to ever paint anything better. 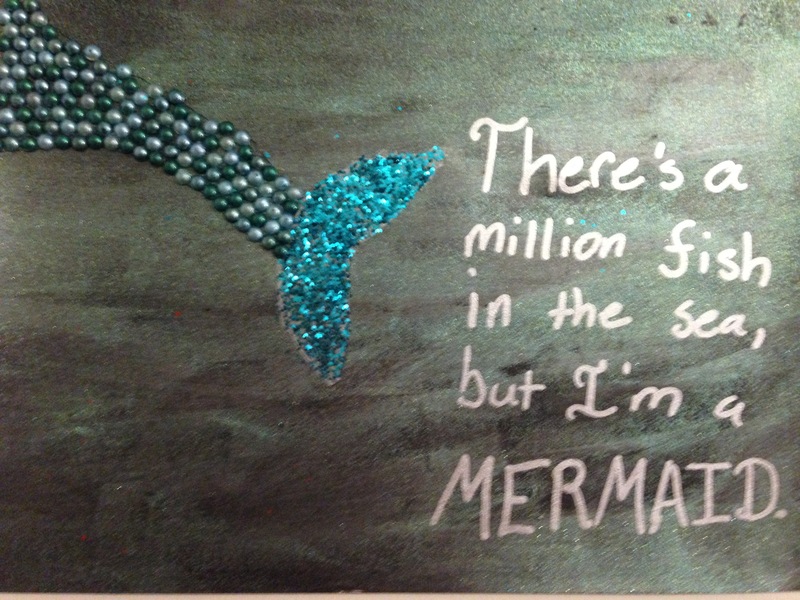 I used six colors (most of them glitter paints), one brush, and a sponge to paint it. It took about two hours to complete. It was the first time I can remember losing myself in a painting: drowning out the world and letting the creativity consume me. I went into that painting without any idea on what to paint. I just let the brush guide me instead of me guiding the brush. That painting was my proudest possession for years afterward, because I figured nothing I created would ever amount to that painting. It hung over my bed for years, and I would often stare at it thinking about much I loved it, but also wishing I could paint something that good again. Six years later, I still feel a sliver of pride when I look at it, however I am more surprised of how much my paintings have evolved. I have painted numerous paintings and have also tried my hand at drawing and sketching. I don’t paint as often as I used to, and when I do my perfectionist tendencies often get in the way. (I’m working on it). 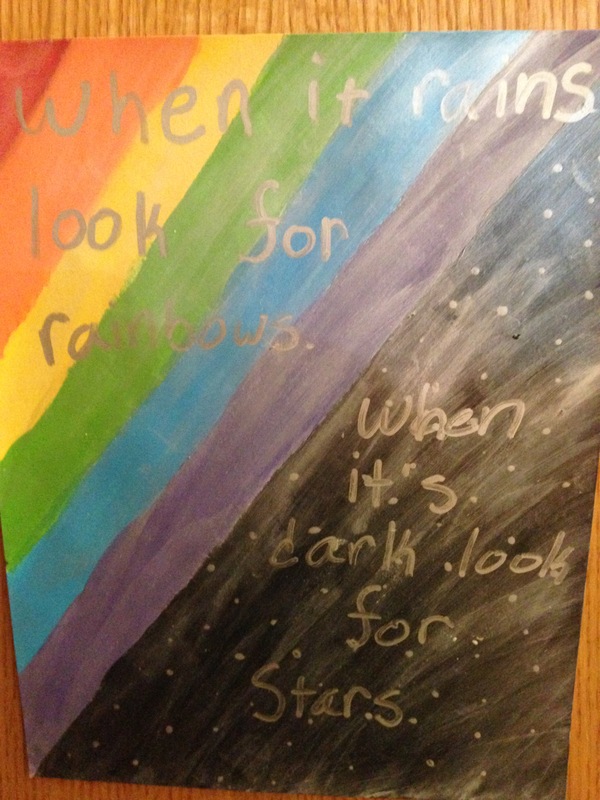 But when my paintings turned out, I get this weird feeling of pride and happiness. The picture on the right is my latest painting completed a little over a week ago. Again, when I look at this, I can’t help but feel a little proud of myself, especially when I think about how far I’ve come. The entire painting was done free hand and took about three weeks to complete. Granted, I didn’t work on it everyday, but it definitely took more time than the one I painted in 8th grade. It turned out much better than I thought it would, and my roommate liked it so much, she wanted to hang it in our living room, which is where it is now. Looking at these two pictures side by side has made me realize a few things about art. First of all, don’t set yourself in the belief that you have reached your full potential. I mean this in art and in life. You can always improve if you chose to. Secondly, art is hard because your toughest critic is always you. No one else can see the picture in you head that you are trying to create, so no one else can compare your art to this idea of perfection. So focus on the positives of what people are saying: your art is probably much better than you think it is. Most importantly, don’t stop creating. No matter how good or bad the end result is, never stop creating things. Your creativity is a huge part of what makes you you, so don’t lose it. Let’s keep creating beautiful things together and make the world a more beautiful place. Getting a tattoo is something I have gone going back and forth on for quite some time- first if I actually wanted one, and if so, what? I finally decided on this simple phrase- my phrase. It started as a simple Home Free song, but quickly evolved into my life mantra. When I was depressed, I wrote it on sticky notes and posted them all over my dorm room, in all my folders, on my mirror, everywhere. I said it to myself at least 50 times a day- I said it to myself until I believed it. This phrase has kept me going and has saved my life over and over again. So it seemed fitting that it would be the one thing I would permanently put on my body. However, working up the courage to actually do so was another story. The plan was to get it for my 20th birthday as a reward for making it two whole decades, but that came and went a month ago and still no tattoo. But then life happened. After some of the worst couple of weeks I’ve ever lived through, the time finally felt right. I had been right on the edge of cliff and beyond ready to jump, partially due to some medication that was seriously messing with my head and driving me crazy. It seemed as though things just kept piling up- my laptop going to hell, my car hitting a ditch, my dog possibly having to get put down- I had reached my limit. I was done. But I survived. I made it. I came out on the other side, and I was okay. After that, I decided it was time. My tattoo is a permanent reminder that things will eventually get better and you can only fall so far into a hole- eventually you hit the bottom and you have two choices- give up and stay there or claw yourself out. I’m not completely in the clear yet, my tattoo helps me remember to keep clawing my way out of that hole and to never stop fighting for my life, no matter how bad that life may seem. No matter what life throws at me, I now have a permanent reminder on my inner hip that everything will be ok.
For whatever reason, I’ve always had a “thing” for eyes. They captivate me. I often find myself doodling eyes all over my notebooks when my classes get to be too boring. So, I figured I would try to actually draw one. It’s very far from perfect, but hey at least I tried. First, I used to transfer paper to trace around the castle and the silhouette of Rapunzel and Flynn in the boat (I am not very good at drawing complex shapes, so transfer paper it is!) onto a 16×20 canvas. Then I used a thin, medium lengthened scripture brush to outline them in black paint. This way, after I am done with the background, I can still see the outlines to fill in the shapes later. This is the video I used to learn how to do this blending technique. For the water, I used the same brush as I did for the sky (rinse off the purple first) and used the same blending technique. I started with a darker blue called “Admiral Blue” and started right at the bottom line of the castle, again putting it on thick so that it is relatively wet for blending. I painted about halfway down the bottom portion of the canvas. I then used “Royal Purple”, and blended it directly into the bottom of the blue. This made the water look more “realistic” for this picture and added a little depth. For the bottom portion, I used a slightly lighter blue called “Copen Blue,” and blended it a little with the darker blue where the colors met, and painted it all the way down to the bottom of the canvas, making sure to paint it thick enough to stay wet. I then used “Royal Purple,” “Admiral Blue,” and “Purple” to blend into the bottom, to make it look more realistic. The weird lighting coming from the sihouettes is from the camera, however I may attempt to add it in to the actual painting, because I like it. This was probably the hardest step. It took awhile to get the clouds how I wanted them to be, but it paid off in the end. I stated by mixing white with about two drops of “Slate Gray”, to get a smokey color. I loaded the same rounded scruffy brush I used for the sky and water, and started by making circular motions on the side closet to the castle. Without ever reloading the bush, I spread the paint all the way to the edge of the castle and the canvas, using circular motions and forming a cloud shape. This gave the cloud a wispy shape to it. I drug the loud down into the water, to cover the seam between the sky and the water. I did this on both sides of the canvas. Once it dried, I continued to do the same thing, always starting on the side of the castle for both clouds, and making the circular motion. This made the paint thin out the closer I got to the edge of the canvas, giving the clouds a more realistic look. After I was satisfied with the white clouds, I mixed in “Purple Lilac” to give the color a purple haze. I then did the same technique on one side of the canvas, but only covered half the space, to make it appear as though the white, lighter cloud was in front of it. These directions are kind of confusing, so below is the video I used to learn how to paint clouds this way. This idea came from step three’s picture, although it didn’t turn exactly as I had hoped. This step could be skipped, and the painting would still turn out beautifully. I did this with a small standard scruffy brush, which I lightly loaded with metallic “Pure Gold”. After brushing most of the paint off, I brushed the paint on using light pressure, and short, whispy strokes. I did this around Rapunzel and Flynn, and made the beam of light more narrow as I got closer to the castle. I also mixed in metallic silver and metaillic white, to give the lighting some depth. I kept making stokes all around the charcaters and up to the caslte until I was satisifed with the way it looked. Again, this step could easily be skipped, especially since it wasn’t part of the original plan. The lighting in the picture is weird for this one, but it was done to show the mixing of colors in the black. I mixed black with some metallic silver and silver sparkle paint (everything but the glitter dries clear). This gave the black a hint of a shine and glitter, which fits the theme of the painting well. Gold sparkle paint would also look good in the paining. Using the same scripture brush I used for the outline, I filled in the silhouette. For some of the more open areas, I used a small, flat brush to fill in to better hide the brush strokes and speed the process up. Most of the black outline from step one could be seen through the paint, but the more difficult parts and the parts that were hidden, I used a small flashlight to see. Simply, put the flashlight under the canvas where the line is, and it shows up much brighter and is easier to follow. When I was done filling them in, I went back and put a second coat on the parts where the paint was filler, and some of the canvas was showing through. I then used metallic gold to fill in parts of the lantern, so it appears lit. The lanterns were the quickest step. I used the same metallic gold from above and mixed it with a few drops of “Lemon Chiffon,” (a very soft, faint yellow.) I used a small flat brush that the size of the lanterns that I wanted, and made short vertical strokes across the sky. You can do as many as you would like- I did more closer to the castle, because that where they are coming from. I used the same color to make smaller ones in the water, to show the reflections of the lanterns in the sky. (If you don’t like the look of them, you could easily leave them off the painting.) While the water ones were still a little wet, I used a small scruffy brush to distort the paint around them, because reflections are usually a little distorted. I then finished the lanterns in the sky by lightly dabbing my scruffy brush in metaillic cold, and making light cirlces on and around the lanterns, to make them look as though they are giving off light. (This could also be skipped if you don’t like the look of it). As you can see, the gold paint around the lanterns is very light and doesn’t go out too far from the lantern. That’s all there was to this painting. It took about four-five hours to finish, which I spread over two days, not including dry time in between certain steps. Everyone I showed it to, loved it and thought it was beautiful. My friend who got it as a gift loved it, and now has it hanging in her room. Definitely a good paintng for décor or for a gift. I’m thinking of doing a Frozen one for my next project. “How to you escape when you’re trapped within yourself?” Those are the words written on the palm of the hand. 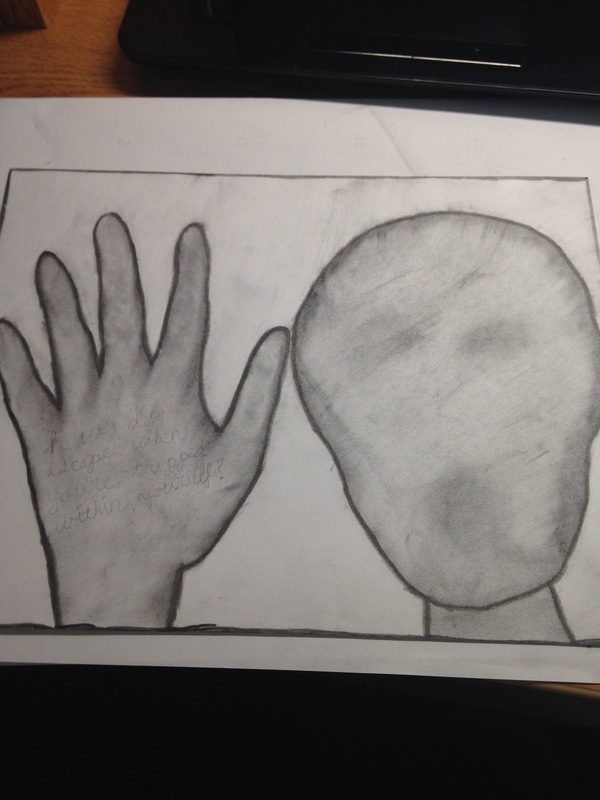 This drawing can be seen in two ways- 1. a person trying to get out with their hand against the glass 2. and person trapped inside and the hand trying to reach them. I’m not going to pretend that was on purpose, but often times our pictures come out deeper than we plan. This drawing was done on a particular bad day. It signifies how I feel on my worst days while battling depression- liked I’m trapped inside my own brain. I’m trying to get out, and make the bad feelings go away, but I’m stuck. But not everyday is bad. And not every bad day is bad all day. So even though this picture may not show it, there is still always hope. Escape is still possible, I just have to figure out how. Always try and find something that makes you happy when times are tough. It can be the simplest of things. For example, when I was dealing with some heavy depression and became suicidal, one thing that helped me get through that dark period was a concert that I had tickets for in two weeks. But it doesn’t have to be that big. It can be as simple as when I finish this paper, I get to go play basketball. When I get off work, I get to see my friends. The point is when life is hard and exhausting, look for a bright spot and focus on that. We should all be reminded that we are all unique. We all deserve the best possible life we can get and we all matter. Don’t be just another fish, be a mermaid. This piece was made from newspaper clippings that were in the New York Times. 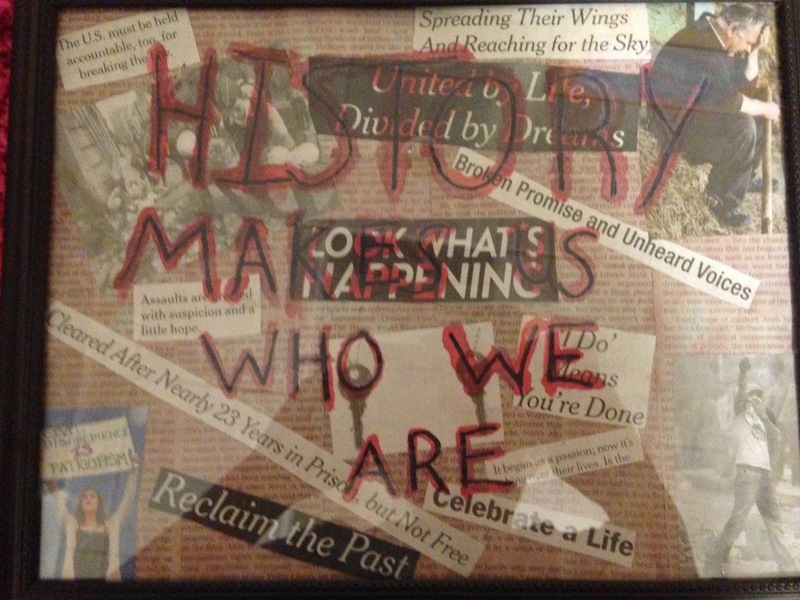 I made it to remind myself that our history is what shapes us into the people, the society, and the world we are today.